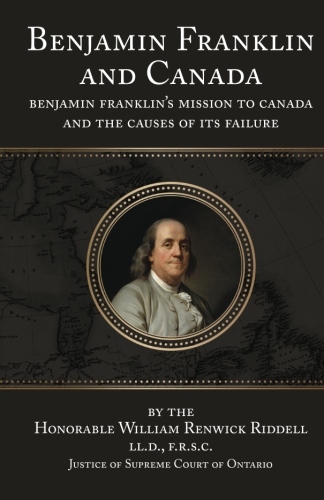 While Benjamin Franklin is of paramount importance to American history, he deserves a place in Canadian history as well. As deputy postmaster general for the British colonies, he established the Canadian post office in Halifax to better link the North American settlements with Britain, and started the mail service in Quebec. He opposed Britain trading Canada for Guadaloupe as a settlement of the French and Indian War of 1760. Franklin owned 20,000 acres in Nova Scotia when it was part of Massachusetts, bequeathing his interest in it to his son William. He helped established the Montreal Gazette, the oldest continuous published newspaper in North America. The Chateau Ramezay in Montreal preserves relics of Franklin’s stay there. The Honorable William Renwick Riddell (1852-1945) was a noted Canadian judge, lawyer and historian. He was appointed to the Supreme Court of Ontario in 1906. He was also a historian and prolific author, writing in the fields of medical, social as well as legal histories. Riddell composed 1,258 articles, lectures, pamphlets, books and reviews, received a dozen honorary degrees and mastered eight languages.